Niko Alm wanted to wear the upturned pasta strainer because he worships the Flying Spaghetti Monster. 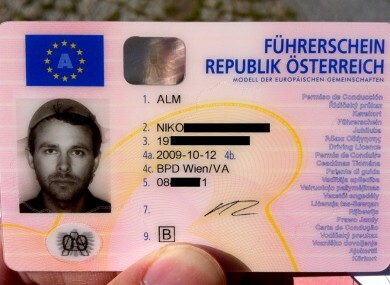 Niko Alm's driving licence, complete with pasta strainer. AN AUSTRIAN MAN has won a three-year battle to have local authorities issue him with a driving licence including an image of a pasta strainer. Niko Alm wanted to have his photo, with the upside-down colander atop his head, included in his licence for religious reasons – claiming he adheres to the religion of Pastafarianism. But AFP reports that when he submitted a photograph – claiming it was appropriate under the country’s usual rules which allow headgear to be included in official photographs for “confessional” reasons – he ran into problems with Austrian licence authorities. They delayed Alm’s application – at one point even sending him for psychiatric evaluation, wondering whether he was fit to drive – but have now finally issued a licence featuring Alm’s photo featuring the inverted pasta strainer. Alm had documented his issues in securing the driving licence on his blog, where he yesterday posted official photographic proof of his new licence. Pastafarianism is a ‘religion’ adhered to by atheists seeking to illustrate what they see as the absurdity of structured religion or the belief in a deity. Its only dogma is the rejection of religious dogma itself, and its basic premise is that a Flying Spaghetti Monster (Pastafarianism’s own deity) was just as likely to have created the universe than a traditionally believed ‘God’. Alm is now hoping to have Pastafarianism accepted as an official religion in Austria. Email “Austrian man wins three-year battle to wear pasta strainer on driving licence photo”. Feedback on “Austrian man wins three-year battle to wear pasta strainer on driving licence photo”.